The yard's frontiers are progressively widening, with the aim of acquiring important shares on international markets, of building increasingly bigger and more luxurious motoryachts. Avant-garde performances and technology perfect the features that have always distinguished Rizzardi's great opens, while exclusive elegance, comfort and refinement are the strong points of the luxury flying bridge Posillipo yachts. As from today the Rizzardi Group has a new logo. The symbol INRIZZARDI is a modern trademark, distinctive and dynamic. It communicates and portrays a sense of envelopment which refers to the sea but mainly symbolises a grouping that evokes the sense of family. The colour red expresses both the passion from which Rizzardi, Posillipo and Italcraft yachts come into being and the attention paid to customer relations. The colour blue recalls the sea in all its grandeur. The symbol is accompanied by the prefix IN which evokes the world of Rizzardi, an overall grouping of the people that are and will be a part of it. INRIZZARDI interprets a new style of being a group, a new way of managing a company and its human resources. The Group's recent acquisition of the Italcraft brand is an emblem of this continual growth. The criteria that led Cantieri Navali Rizzardi to opt for the absorption of this specific yard on the Gaeta coast were based on the strategic possibility of building large size pleasure craft and having a further direct and crucial gateway to the sea. In fact the Italcraft operational area stands on an overall 36.000 sq. m. (about 10.000 covered). This space guarantees an increase in the production capacity of the Rizzardi Group which formerly had an overall area of about 120.000 sq. m.
The possibility of having an extended workforce close to its traditional headquarters will facilitate the passing on of know-how. But the main aim of the operation is to concentrate on the Italcraft brand name, just as Cantieri Navali Rizzardi did successfully with the Posillipo brand, the Group's luxury flying bridge yachts. This is another reason why it was decided to keep the main models unaltered, such as Sarima, X54, X46 and Drago 70. Today the Rizzardi Group represents a solid concern in the pleasure craft sector. The strategic areas it has purchased mean that the company can offer customers a suitable service of assistance and refitting, complementary to its core business of shipbuilding. 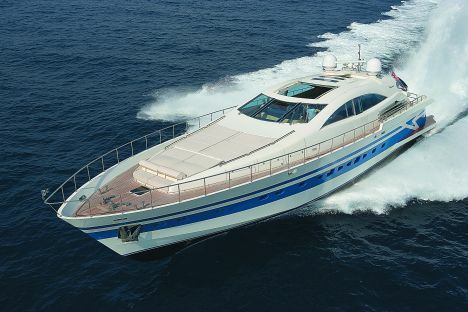 Excluding the Italcraft workforce, the Group's production premises and boat maintenance areas involve about 140 employees, plus another 600 subcontracted workers. No less important is the employment contribution generated in the many local workshops that receive subsidiary contracts. Rizzardi Group activities came into being and were developed as a result of Gianfranco Rizzardi's great enthusiasm and entrepreneurial approach. In these years he has taken the company to increasingly ambitious goals. The original production unit in Sabaudia (LT), on an overall area of 60.000 sq. m. (with about 11.000 sq m. covered) was augmented, after the purchase of the Posillipo brand and premises, by the new industrial plant in Cerasella with its 6000 sq m. of covered area, equipped with the latest innovations in the nautical field. The premises are currently being extended to a total covered area of 10.000 sq. m.
From a strategic point of view, in the course of 2002 it was deemed urgently necessary to be able to rely on production premises, with an outlet to the sea, where large size vessels (30 metres plus) could be built, thus avoiding the costly transport problems involved in reaching the launch zones. To this end the Group identified and purchased a production complex in the area of Fiumicino (Rome) with an overall covered area of around 2000 sq. m.
The purchase of this complex was strategic for the yard. Over and above the possibility of simultaneously building two vessels over 30 metres in length and fitting them out directly on the water, it gave the Group the chance to own a yard in the Rome area and, most importantly, to be close to Fiumicino airport which is the traditional point of arrival for foreign customers. In 2003 the company bought shares in Cantieri Navali Netter of Fiumicino, a historic yard specialising in refits, in maintenance and in the sale of second hand vessels. This company has 3.600 sq. m. of sheds, 5.000 sq m. of yards and a dock that can accommodate 50 medium-large size vessels. It also has 170 metres of quay along the river where vessels of up to 40 metres can moor. To extend its offer of services to the possibility of assistance and refitting - including vessels over 35 metres - the Rizzardi Group purchased the CNR shipyard area in Ostia (Rome) which stands on an area of 11.000 sq. m. (2.200 covered). The operational area is equipped with a travel-lift (400 t. capacity) and a truck for handling yachts up to 50 tonnes. The Fiumicino-Ostia axis has thus become the Rizzardi Group's service area, a reference point for the Central Italian market, while also supplying integrated services to customers from the capital. In the context of an increasingly attentive policy aimed at customer requests and consequent completion of the range, two new flying bridge model designs are in the final phase: the Posillipo Technema 85 and the Technema 120. Creation of the 85 (to which the renderings refer) is certainly at a more advanced stage. The launching of vessel N° 1 should take place shortly.